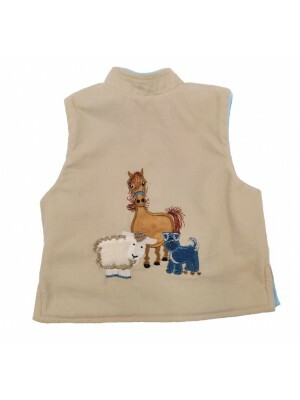 A reversible bodywarmer with navy fleece on one side and a farmyard applique on the back and a beige cord on the other. Popper openings down the front. Fabric Content – 100% Cotton Cord /Polyester Fleece Garment Care - Cool mach.. 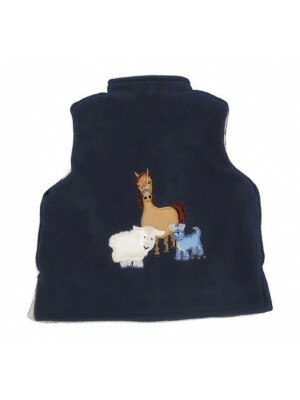 Perfect to pop over any outfit on cooler days this reversible bodywarmer with a cosy fleece on one side and a 3 vehicle applique and a navy cord reverse. Popper openings down the front and pockets to both sides. 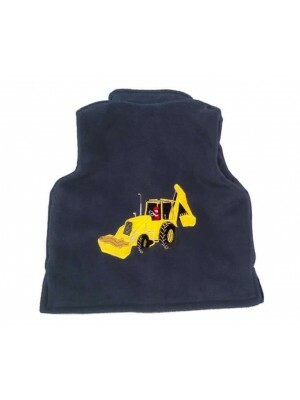 Fabric Content – Cotton ..
Reversible bodywarmer with navy fleece on one side featuring a yellow digger applique on the back and a navy cord on the other. Popper openings down the front. 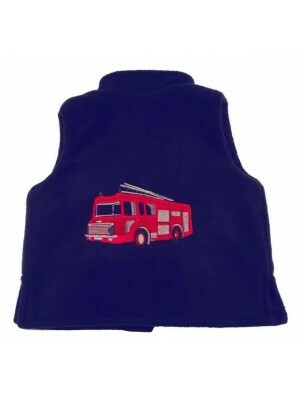 Fabric Content – 100% Cotton Cord / Polyester Fleece Garment Care - Cool m..
A cosy reversible bodywarmer with fleece on one side and a big fire engine applique and a navy corduroy on the other. Popper openings down the front. 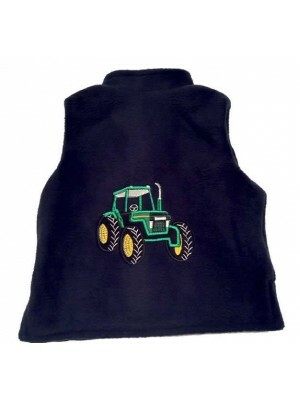 Fabric Content – Cotton Corduroy with Polyester Fleece Garment Care - Cool machine w..
A reversible bodywarmer with a navy fleece on one side and a corduroy on the other featuring a fabulous green tractor stitched applique on the back of the fleece side. Popper openings down the front. 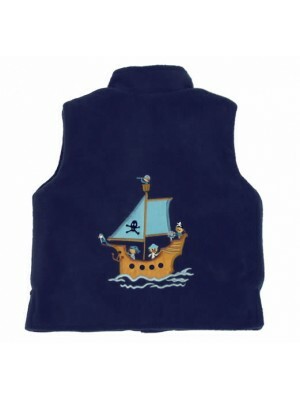 Fabric Content – 100% Cotton Cord / Polye..
A lovely summer reversible bodywarmer with navy fleece on one side featuring a pirate boy applique and a navy corduroy on the other. Popper opening down the front. 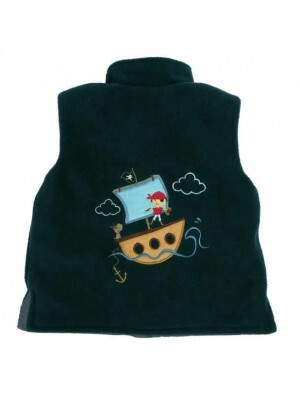 Fabric Content – 100% Cotton Corduroy/Polyester Fleece Garment Care – Cool m..
A reversible bodywarmer with fleece on one side and cord on the other featuring a pirate ship applique on the back of the fleece side. Popper openings down the front. 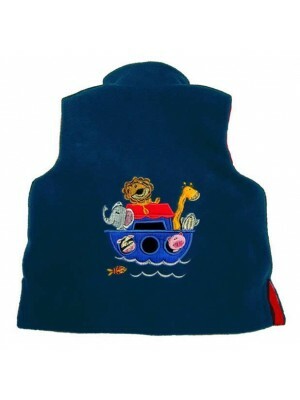 Fabric Content – 100% Cotton Corduroy / Polyester Fleece Garment Care – C..
A reversible bodywarmer with red corduroy on one side and navy fleece on the other featuring a Noah's Ark applique on the back. Popper openings down the front. 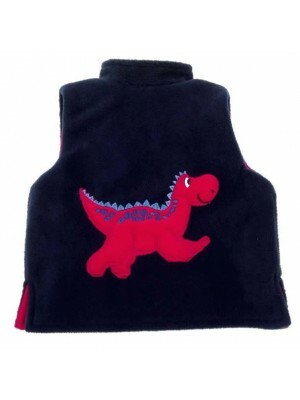 Fabric Content – 100% Cotton Corduroy/Polyester Fleece Garment Care – Cool machi..
A cosy reversible bodywarmer with corduroy one side and fleece on the other featuring a big red dinosaur on the back of the fleece side. Popper openings down the front. 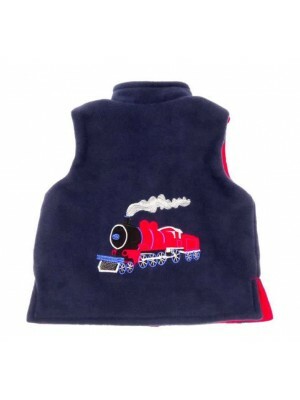 Fabric Content – Cotton Corduroy/Polyester Fleece Garment Care – ..
A completely reversible bodywarmer with a cosy fleece on one side and a train applique and a red needlecord on the other side. Popper openings down the front and pockets to both sides. 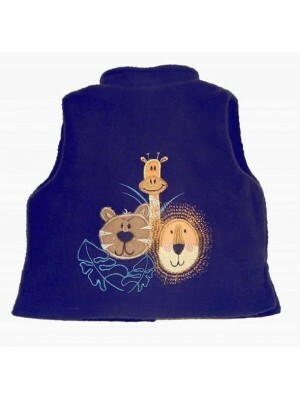 Fabric Content – 100% Cotton Cord / Polyester..
A reversible bodywarmer with navy fleece on one side featuring a jungle applique and navy cord on the reverse with popper openings down the front. 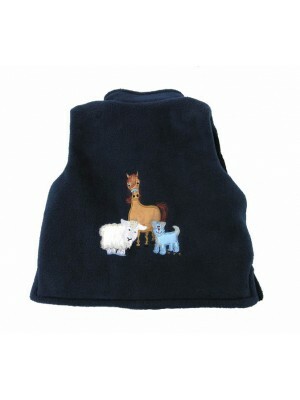 Fabric Content – 100% Cotton Corduroy/Polyester Fleece Garment Care – Cool ma..
A reversible bodywarmer with cosy fleece on one side and a farmyard gathering applique on back of the smart beige cord reverse. Popper opening down the front. 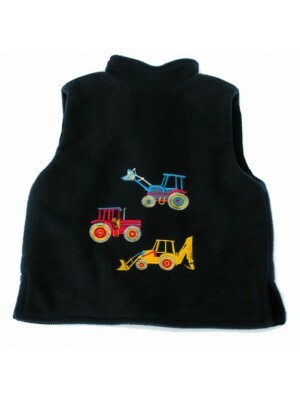 Fabric Content – Cotton Corduroy with Polyester Fleece Garment C..
A reversible bodywarmer perfect to pop over any outfit on cooler days. 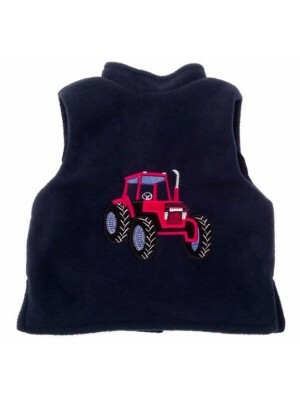 Popper opening down the front and a farmyard gathering on the back Fabric Content – 100% Cotton Cord/Polyester Fleece Garment Care - Cool machine wash. ..
Reversible bodywarmer with navy fleece on one side and navy cord on the other featuring a tractor applique on the fleece side. Popper openings down the front. Fabric Content – Cotton Corduroy with Polyester Fleece Garment Care - Cool ..